Do you enjoy a good sale? Visit our thrift store in Greenwood where you can shop for quality merchandise at great prices. Offers customers good value and a pleasant shopping experience. Maximizes the use of donated merchandise. Increases community awareness of HospiceCare of the Piedmont. 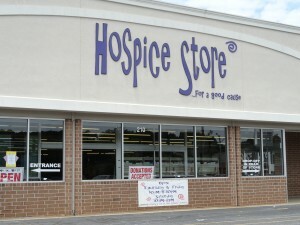 Hospice Store receives generous donations from members of the community. The store’s success depends upon a continuing supply of quality merchandise to sell at reasonable prices. If you are interested in recycling quality merchandise for a good cause, donations can be taken directly to the store. Pick-up service for furniture is available by contacting the Hospice Store in Greenwood at 229-9393 or in Abbevile at 366-0237. A tax deductible receipt will be given for all donations. *We cannot accept mattresses, computers, pianos or large building materials. We are always looking for new volunteers. If you are interested in volunteering at the Hospice Store please contact the store manager in Greenwood at 229-9393 or in Abbeville at 366-0237.